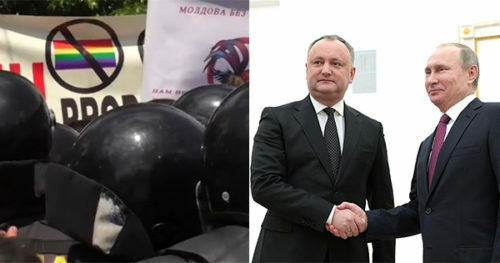 An LGBTQ Pride march in Moldova, on May 21, didn’t last long, as police but a halt to it shortly after it started, citing a fear of conflict between the rights activists and anti-LGBTQ demonstrators who were also on the scene. The Pride marchers had water and eggs thrown at them before police evacuated them in buses, Radio Free Europe reports. Last year’s march, organized by the same group, GENDERDOC-M, was also stopped shortly after it began due to concerns over clashes with those opposing LGBTQ rights. He had previously criticized the march, saying it would go against the country’s traditional values. “They cannot and will not be accepted by me personally, neither by the entire society,” Dodon said. On May 17, the International Day Against Homophobia, Transphobia, and Biphobia, ambassadors to Moldova from the United States, Britain, Germany, France, Italy, the Netherlands, Sweden, Switzerland, Lithuania, and Estonia, issued a joint statement saying they hoped the LGBTQ rights demonstration would go ahead without interference or incident. GENDERDOC-M has posted a video of a Moldova Pride event from this year that went over without conflict, and appears to have taken place in a bar or club.